I posted a picture of an expedition porter on the Hispar La in Pakistan a month or so ago, and it got over half a million hits, and thousands of comments and likes. I paraphrased a eulogy writer by a member of the Karakoram Club about the heroic efforts of such men supporting the mountaineering and exploratory endeavours of us "adventure travellers"
The work of men like these is not so glamorous, but underpins a much bigger part of the "adventure tourism" industry in places like Nepal, as well as much of the general economy in upland areas. Think of them the next time you sit on a sunny terrace in Khumjung sipping an ice cold lager! 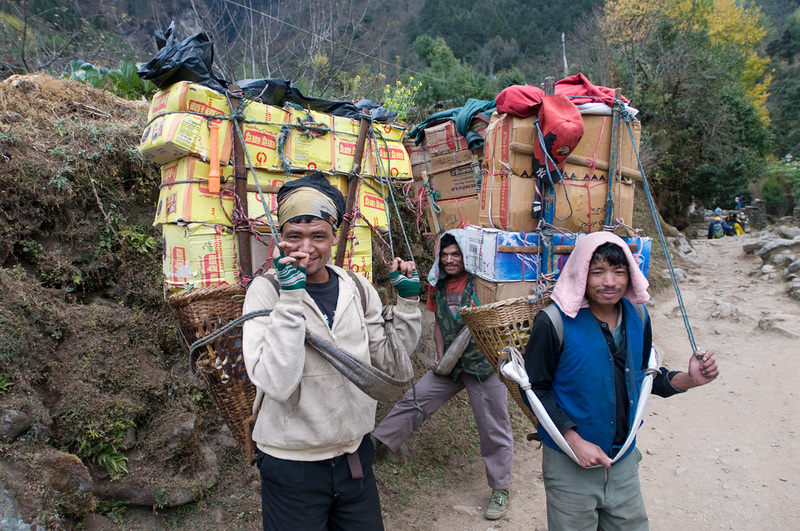 In the absence of roads, all commodities and goods have to be transported to remote communities on the backs of porters. Many of them seek to maximise their income by carrying double or even triple loads. Each of these men is carrying in excess of a hundred kilos! I could not even stand with such a load on a tump-strap (the head-band used by Nepali porters), let alone walk all day up some of the steepest trails on the planet. Here they are standing taking a rest, balancing their loads on their sticks. You can see that they have ropes tied to the tops of the loads to stabilise them while walking. When you see this you may understand why such men queue up to work for expeditions, where the loads are much more rigorously regulated and their conditions of employment are so much better. Nikon D300, 17-35mm. November 2008.